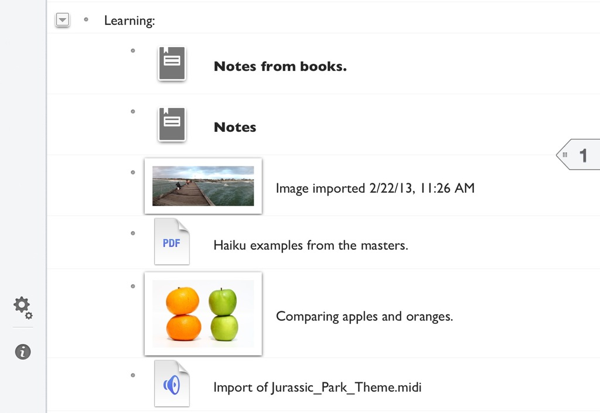 These notes will hold files that are imported into ThinkBook images, documents, video, audio, more or less anything that the iPad can handle ThinkBook will be able to organize for you. While developing the new notes I thought about them as either 'attachments' or 'imports', but when the time came to start writing the documentation I wasn't so sure that either one of those was a good fit. So I took the coward's way out and asked twitter for opinions and suggestions. In this post I want to go through what was suggested and why in the end I'll probably end up going with 'attachment' note. File - It's a good idea but Apple would prefer that developers don't present file-system like interfaces and that we stay away from anything 'file' related. Things - I liked 'things' but although it works as a word to describe the concept it doesn't work well in the interface or documentation. For example 'ThinkBook makes a Thing note when it detects an image in the clipboard;. Stuff - Again, describes the concept well but doesn't work in the interface. Media - Works well in the interface and documentation but can send the wrong message. I think most users would associate the word media with video and sound, probably images too, but they wouldn't think of a media note holding a pdf or a spreadsheet. Rich Notes - Good too, but slightly wrong association, a lot of people would think 'rich text! ', and expect ThinkBook to be able to handle text colors and formatting. Inserts - I like this one because it fits well in the notebook/pages metaphor that ThinkBook loosely adheres to. It's impossible to write documentation for it though, 'To insert an Inserts note …', it's a verb to it could get confusing. Viewables - not everything that ThinkBook can import can be viewed, an audio file for example. Also, some things are can't be opened in ThinkBook, like a Midi file. Items - This one is good, it represents the idea of the note well and it reads well in the interface and documentation. So in the end it was down to three choices, 'item', 'import' and 'attachment'. Of those three I think 'attachment' is the one that works best. Most users of ThinkBook will be familiar with the concept of an email attachment. In an email there is this 'thing' that comes with the text, that you can sometimes see in the mail client but sometimes you have to use another program to read, or listen, or watch. An attachment stays with the email for as long as you keep the email. If you are writing an email you can attach a file to it, and in ThinkBook if you are writing notes you can attach files or images to the page. I'd like to thank the heck out of everyone that had suggestions. I think they were all great and I would have liked to use not just one but ALL of them. You know, in the 'Rich media file insert thing viewable stuff and items note'.